Expose your brand-name with some stunning Reusable Thermo Promotional Coffee Mug and gain some advertising along the way. Double insulated and thermo designed for a hotter drink for longer, you can screw the lid down and keep your hot beverage stable and walk around with your favourite drink, gaining brand-awareness and exposure for your Company! 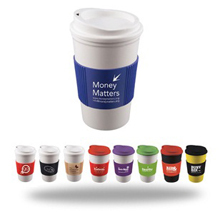 Your logo, brand-name and corporate brand name never looked so better, and with the possibility of gaining more business opportunities and leads, why not hand out a batch of these Reusable Thermo Promotional Coffee Mug and these stunning Americano Mugs will act as your very own little silent salesmen, gaining business along the way! For a FREE QUOTE, please fill in the form regarding our Reusable Thermo Promotional Coffee Mug and we'll be able to help you.